Welcome to the ultimate, yet simple, versatility of Timberlane seating. Appealing in both design and application, Timberlane sits beautifully in dining rooms and cafeterias, welcoming and reception areas, private offices and more. With various upholstered and wood back styles, armed and armless options, ganging capabilities including tables and tandem selections, Timberlane’s flexibility offers a custom feel at an exceptional value. 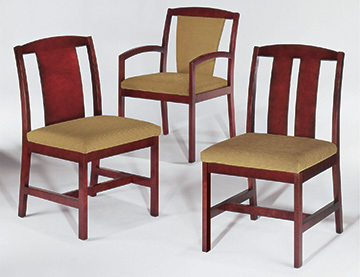 Enjoy a bariatric model, 3/4 upholstered backs for easy cleaning, protective arm caps and a durable finish that holds up to bleach-based cleaning solutions. Plus, Timberlane is certified SCS Indoor Advantage Gold™ and level® 2 which can contribute towards LEED® points.